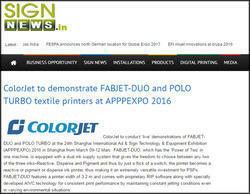 ColorJet to conduct ‘live’ demonstrations of FABJET-DUO and POLO TURBO at the 24th Shanghai International Ad & Sign Technology & Equipment Exhibition (APPPEXPO) 2016 in Shanghai from March 09-12 Marc. FABJET-DUO, which has the ‘Power of Two’ in one machine, is equipped with a dual ink supply system that gives the freedom to choose between any two of the three inks–Reactive, Disperse and Pigment and thus by just a flick of a switch, the printer becomes a reactive or pigment or disperse ink printer, thus making it an extremely versatile investment for PSPs. FABJET-DUO features a printer width of 3.2 m and comes with proprietary RIP software along with specially developed AIVC technology for consistent print performance by maintaining constant jetting conditions even in varying environmental situations. 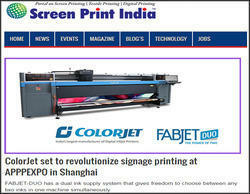 FABJET-DUO has a dual ink supply system that gives freedom to choose between any two inks in one machine simultaneously. 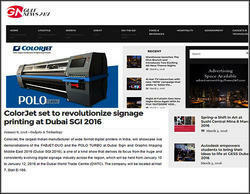 POLO TURBO is a high speed industrial grade solvent printer built on a heavy duty structure. 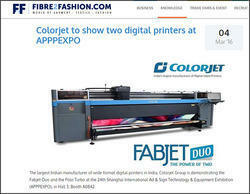 ColorJet Group, the largest Indian manufacturer of wide format digital printers in India, will showcase live demonstrations of the FABJET-DUO and the POLO TURBO at the 24th Shanghai International Ad & Sign Technology & Equipment Exhibition (APPPEXPO), in Hall 3, Booth A0842. The Fabjet-Duo has a printer width of 3.2 metres and comes with proprietary RIP software along with specially developed AIVC technology for consistent print performance by maintaining constant jetting conditions even in varying environmental situations. 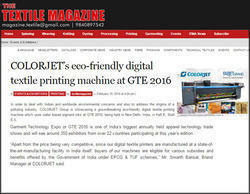 India's biggest digital printer producer, Colorjet Group is showing an eco-friendly digital textile printing machine which uses water based pigment inks at GTA 2016, being held in New Delhi in Hall E, Stall E-5. According to a Colorjet press release, the Fabjet Grand is a commercial grade 3.2 metres wide digital textile printer and uses water based pigment ink. “The Fabjet Grand is suitable for the customized home furnishing textile segment, particularly for producers of home décor products like curtains, bed covers and sofa covers,” the company said. “The printer delivers high productivity enabling high daily printing volumes and outstanding runnability for overnight printing without bending and colour deflection,” Colorjet added in the press release.